The Dobblers is a traditional 'backstreet boozer', situated in a densely populated area of Cambridge, close to the Grafton Centre. The pub has a beautiful courtyard beer garden with heated smoking area; some say the best in town! For the sports fans the pub boasts 5 large screen TV's with Sky Sports HD and BT Sport, with an additional screen in full view of the garden! On Tuesday there is a pub quiz where drinks and cash prizes can be won and throughout the week you will find our pub teams (darts, crib, pool, cricket and football) discussing recent performances. We are pleased to have Cask Marque accredited ales which include Wells Eagle IPA, along with guest beers such as Wells Bombardier, Youngs Bitter, and many seasonal ales. 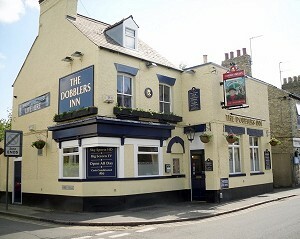 The Dobblers is a community pub with real characters from all walks of life socialising here, which creates a loud, lively and friendly atmosphere. A proper local's pub!